According to the U.S. Bureau of Labor Statistics, slip and fall injuries are the 3rd largest cause of workplace injuries and the average slip and fall injury costs $28,000. The National Safety Council reports that the slip and fall injuries are the largest cause of Emergency Room Visits. In an effort to assist you in making your workplace safer and decrease the possibility of slip and fall injuries this winter, we are making two specific Outdoor Entry Mats available. 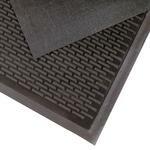 The first is the Soil Guard™, a durable, 1/4", low-profile rubber mat. It is designed for high traffic areas. This mat, with its specially formulated rubber stays flexible even the coldest weather and its “raised bar” design scrapes debris from shoes easily. The second mat is the Rubber Brush™. 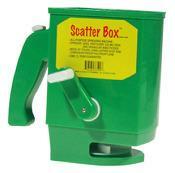 It is constructed of tough SBR - Styrene-Butadiene Rubber. It too remains flexible in extreme cold and has a 5/8" thickness. The mats flexible rubber fingers sweep shoes clean while suction cups on the underside help minimize the mat from shifting. All four sides of the mat are beveled. 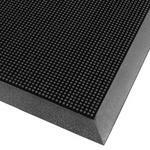 These outdoor entryway mats are made to the highest quality standards by The Superior Manufacturing Group, headquartered Chicago, IL with manufacturing facilities in Georgia, Mississippi, Rhode Island and The Netherlands. Many of us use granular ice melt on our walkways and parking lots to help keep them clear. The more severe the winter, the more ice melt we tend to go through. As you know, it can get expensive! Over applying any ice melt, no matter how “safe” it is can be damaging to concrete, metal and vegetation. To assist you in the proper application of ice melt this Winter we are offering two spreader options, a handheld spreader called the "Scatter Box" and a Broadcast Spreader with shoulder strap and canvas bag. Both carry a one-year guarantee. Note: Prices quoted include delivery to customers we serve in the Inland Northwest only; Spokane, Washington, Coeur d' Alene, Idaho and surrounding communities. Applicable sales tax not included. 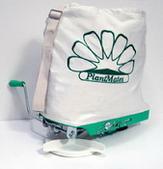 And yes... we sell environmentally friendly Ice Melt by the 50# bag or pallet (49 bags). Please call for pricing and availability.